Living with debt is a juggling act. You are asked to make large debt payments every month on top of your regular living expenses— like food, child care, gas, and utilities. This is a disastrous recipe for missed payments. As months go by without decisive action, an adverse effect on your credit score can occur. It also won’t take long before distressing calls from your creditor or credit collection agencies begin to disrupt your day. Those suffering with debt have options to turn around their financial situation. One such solution is debt consolidation, which takes your multiple debt payments and transforms them into one that’s more manageable. Beware, not all debt consolidation is equal. How Does Debt Consolidation Work, and Is It Right for You? Debt consolidation is an excellent choice if making your monthly debt payments has become difficult or impossible. While not paying may give you a short respite, over the time it can be disastrous on your credit score which will follow you around for years. Debt consolidation helps restructure your loan with lower monthly payments as an outcome. There are two ways debt consolidation occurs. First is through debt consolidation programs which combine unsecured credit into a single payment using nonprofit debt management. The other is a debt consolidation loan, which takes out a new loan to pay off the others. We will go into more detail with each below. 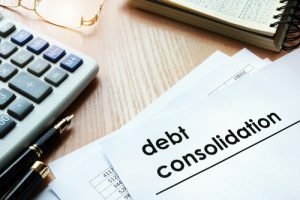 As mentioned above, a nonprofit debt consolidation program bundles your unsecured debts into a single lower payment and in some cases reduce your interest rate up to 50%. Examples of unsecured debt are credit card bills, unsecured lines of credit and medical bills. This is only achieved with the help of a certified credit counselor who negotiates with creditors on your behalf. At CreditGUARD, we firmly believe this is the superior method because it doesn’t only lower debt, but it also rebuilds your credit score through scheduled payments. Some nonprofit debt consolidation programs, like those at CreditGUARD, offer educational and budgeting tools as well. This is important because it teaches a positive financial lifestyle to keep you out of debt for years to come. The second, and far riskier, method to debt consolidation is with a debt consolidation loan. This approach consists of taking another loan out to pay off your unsecured debts. While this is a quick fix to your financial problems, it often comes with a series of unseen negatives. Most debt consolidations loans cannot offer you a lower interest rate than the one you already have. To lower your monthly payments, these loans are extended over a longer amount of time. These two factors often end up making this new loan more expensive than the initial. Additionally, this new loan will allow you to fill up your credit cards again and that will result in double the amount of debt that got you in trouble in the first place. The only real solution is to get out of debt and stay out of debt. That is where financial education and budgeting come into play Without any financial education programs to develop proper spending habits, you can potentially find yourself right back where you started by charging up the same credit cards you’ve only recently consolidated. CreditGUARD’s program does not involve any new loans. There is no shame in being in debt. Millions of Americans are suffering from this same financial burden. Say no to living a life of high monthly payments and harassing phone calls from creditors, and turn your life around with CreditGUARD. Our debt management, nonprofit debt consolidation, and financial education programs will set you on the right path towards a brighter financial future.